whats the best direction for the 4th skill guys? everyones got a pretty clear #1 choice, like sixth for the commander, then they get bia, and repairs. looking at it I can find find something useful for the commander and driver at 4, but that leaves four guys to either go fire prevention or camo, or I can do the loaders with intuition and the other two fire/camo/whatever. obviously camo is of limited value, but less visible is always better than more, right? ive never trained fire, maybe I could drop my extinguisher and open up that slot? Does your commander have "mentor" ? I'd slap that on him. And if you've done repairs(do repairs if you haven't) fire fighting works. You done all your gunner ones? get those before fire fighting if you haven't got them. Edited by gmotoman, Feb 26 2019 - 01:23. Adren rush rarely happens. better off with double Safe in case on gets taken out. Edited by tod914, Feb 26 2019 - 02:15. Don't waste that talent languishing in the barracks. Put that crew in a T1 heavy and just go seal clubbing. Edited by gmotoman, Feb 26 2019 - 02:48. Repairs is very helpful. I'm using a repair box on some tanks because with all the machine gun like tanks they can keep you disabled until killed. Of course directives help too. Edited by 13Jake55, Feb 26 2019 - 02:50. Normally, maximizing survival and then gun handling/view range ( is a good basic crew skill strategy for heavies. Gunner: BIA Snap, Repair, Armorer (replace with Deadeye at 100%) - Deadeye is good but its not better than 40% of a Vstab (Snap) that will pay dividends hitting more shots. Driver: BIA, Clutch, Repair, ORD, Smooth - I like clutch for juking easier and maneuvering in close quarters and Smooth Ride is not as good as most think. Swap ORD, Smooth and Clutch to your own fancy. RO: BIA, SA, Repair, Camo - the rest of the skills/perks are [edited]e anyway. Loader #1: BIA, Safe, Repair, Camo - the rest of the skills/perks are [edited]e anyway. Loader #2: BIA, Safe, Repair, Camo - the rest of the skills/perks are [edited]e anyway. - Safe doesn't stack but you can potentially move them to another tank without retraining a worse choice (or quick train another loader without losing Safe). In the age of reuseable consumables Preventative Maint is not as attractive and it only works on engine fires (Not fuel tank fires a much more common cause). Same goes for JOAT, if your dropping a med kit sure but otherwise don't waste a skill slot there. Lastly, please don't train Mentor on any crew. There is no sense rushing other crew members to useless skills while hamstringing your commander and your performance. Safe stowage only works on one loader, it does not stack. Training on both is just a wasted spot unless you plan on moving them in to different tanks later. How truly effective is a 100% Firefighting crew? How much fire damage will you take? I ask because I am leery dropping the auto fire extinguisher to run food. I have safe stowage, and engine maintenance at 100%. 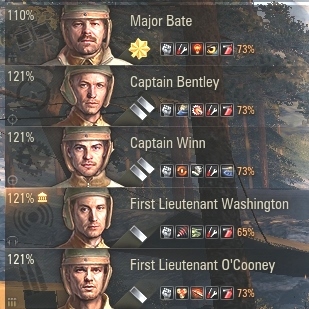 Almost 100% all crew repair. Looking for a 4th skill, 3rd will be BIA. It's pretty good but is tank dependent. Chinese tanks tend to get their modules hit a lot, rear turreted tanks is a no brainer, and some German tanks suffer from engine damage fires too. Generally speaking the threat of fire is evident on every tank so it's just up to you. Another thing to consider is that food is pretty expensive unless you have a bunch saved up from missions I generally never run food except on my tier IX's and X's. Even then only if my crew also has BIA, and vents as all the effects will stack making a bigger difference. just my two cents. appreciate all the responses. it looks like there are a couple votes for camo and a couple for fire. several deadeye votes too. I used to run that, but it seemed to me I got more crits, but at the expense of damaging shots. it might have been my imagination, as its a small percentage bump perk in the first place. but those of you who mentioned it think it helps? no one mentioned intuition. that didn't seem to do much when I tried it awhile back either. anyway, thx again for the input! happy tankin! Eeeeee so many people suggesting bad setups. Commander: sixth, Repairs, BIA, recon. Loader: repairs, safe stowage, BIA, camo. Radioman: repairs, Situational Awareness, Bia, camo. Granted, I play mostly fast/mobile heavies. Not slow stuff like the Type 5 etc. If the commander is the radioman, do sit. Awareness instead of recon. It gives like twice the view range bonus. Speaking of Camo - yes, camo as 4th skill. You dont overlook the view range bonus of recon and some heavies need that traverse speed to prevent being circled, But for the other crew members most of those skills are pretty useless. Maybe deadeye for the gunner but meh. However; even on a heavy tank dont overlook the importance of camo. It can be that tiny bonus that prevents a light tank spotting you crossing at the start of the game and getting you farmed. It can allow you to get just that much closer before being lit in a push or if you're trying to get to an aggressive spot. Don't ever overlook the importance of not being seen even on a heavy tank. Some of them I even take it before BIA. Repairs - I take this as first skill on EVERY. SINGLE. TANK. (Except arty) getting your tracks back up ASAP is one of the most important things in the game and WILL keep you alive longer in all situations. Nothing is more important than a skill that directly increases your survivability in this way. Second: repairs commander and loader, snap shot, smooth ride, situational awareness. 5th: pick what else is useful. Recon, deadeye, clutch braking or maybe offroad driving, depends on tank. Firefighting on loader and radioman because the other skills are literally useless in their entirety, and are all perks. So just drop firefighting for them at 100% if you want and retrain it. Edited by FunkyMonkey911, Mar 02 2019 - 01:20. I had been leaning twords camo for those same reasons. but it is a big honkin tank. and the same crew plays in the t34 as well. id been waffling on this for long enough to get up close to 50% trained, and unpicked it was skill bonus wasting, so last night I when to went to play the 29 I decided to break the tie by going with something new, and trained 5 of the crew to firefighting. and then I return here tonight and find some ringing endorsements for camo. figgers! oh well maybe ill learn a little about firefighting. its the first time ive tried it anywhere. when they get to about 75 or 80% im going to drop my extinguisher and see if theres more/less incidence of fire. ill report back here when I have some results to share.. thx again everyone!